Jespers is able to dig underneath the muddy web of identity to reveal the shared roots of all relationships. Relationships lost, born, and rekindled fill Richard Jespers’s collection of short stories, My Long-Playing Records and Other Stories, all but one of which have been published in literary journals. Yet the fifteen emotionally complex, character-driven stories are not simple tales of love and loss. Instead, Jespers highlights the crucial role of relationships as his characters navigate the tricky realities of life. This delicate balance of harsh realities with tender moments of trust, companionship, and love is reflected in the collection’s title story, which was nominated for The Pushcart Prize. 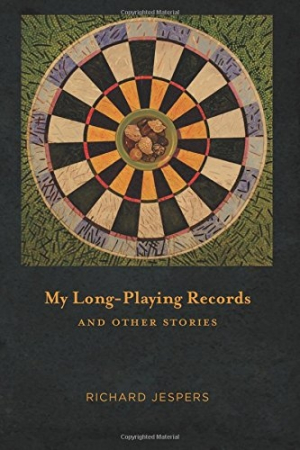 The main protagonist in “My Long-Playing Records” proclaims his preference for the hiss and scratch of analog versus digital sound. Jespers seems likewise taken with the unexpected pops and crackles in life that seem imperfect on the surface but end up adding levels of warmth. Included among the narratives are a needy adolescent who befriends his bully and possible love interest while reconnecting with his father; a mentally slow, mature son experiencing the death of his father, his sole caretaker; a loveless older married couple who reconnect on a trip to Las Vegas; and a closeted gay married man who gets burned by his lover while establishing a new kind of relationship with his wife. Music, whether on records or church organs, plays a steady beat throughout the collection, yet the overwhelming themes are relationships in flux. Whereas an editor might have steered Jespers into including only gay or straight couples, he eschews such pigeonholing, and self-publishes his stories. “Heaven forbid that readers or journal editors wander into a life that might be a bit different than their own and yet astonishingly similar,” he writes in his introduction. As relationships are lost and others reborn, the pain lingers long after Jespers’s narratives end. The loss of a parent and a lifelong partner is made achingly visceral in “The Best Mud” when Coop, intellectually handicapped after a lawn mower fell on his head as a child, is left utterly unmoored after his father dies. Other stories, however, are not as strong. “A Gambler’s Debt” seems underdeveloped: decades of resentment in a loveless marriage are too quickly healed when the couple happens upon a forgiveness seminar in Las Vegas. And in “The Age I Am Now,” the main character witnesses the assassination of a Dutch filmmaker only to return stateside to deliver a tirade against America, an overly sentimental scene that ends with Korean women dousing him in cold pool water. Despite these rare weak points, Jespers has skillfully created a literary album of sorts, full of melodies that pop and hiss with real life. And because a variety of relationships—gay, straight, and paternal—are represented, Jespers is able to dig underneath the muddy web of identity to reveal the shared roots of all relationships; namely, vulnerability and trust.